“You need to burn some sage in here.” I was alone in my home. These intuitive words sounded as though they’d been whispered from within a pile of rubble. Taken aback, I slowly scanned the main living area of my home. Pride chattered inside my head with justifications such as “It’s fine” and “I just cleaned it two days ago.” I then dropped inside myself to what I couldn’t see. A dark leaden blanket of energy covered me, and I felt choked. Tears filled my eyes as I consciously “felt” my home. I bought my first bundle of sage within an hour and got busy researching what I might do next. Our homes, lives, and everything inside them are filled with, and surrounded by, energy. Every “thing” possesses a degree or level of this power. Some of us may be more sensitive to or intuitive surrounding this power, but it greatly affects us all whether or not we are completely aware of it. There are times when we will feel a higher vibration of these energies—for example, when we connect with friends and loved ones, laugh until we cry, or hear affirming words. Other times we may be filled with the lower vibration of energy brought on by physical pain and sickness, hearing or reading upsetting news, or spinning in thought over a recent argument. These vibrations, both high and low, saturate us, our homes, and our “stuff.” It is crucial, in my opinion, to regularly clear out (smudge) these lower vibrations of energy. 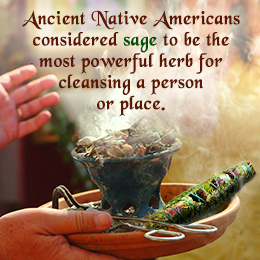 The practice of burning sage is known as smudging. When you smudge your home, work environment, or your own aura with sage, it’s like an energetic shower. The smoke from dried sage changes the surrounding air’s ionic composition. It increases negative ions (the kind we need more of to feel relaxed). This has an immediate effect on calming our brain’s stress response. With the constant stimulation of today’s impossibly fast-paced society, paired with our perpetual need to scroll through social media or read the news, most of us live in the state of stress we all know as the fight-or-flight response. This leaves our nervous systems, and our living and working environments, pulsing with adrenaline and its effects. It can be an inconceivable task to persuade our nerves to settle enough for us to decompress and relax in our homes. Changing the ions changes the type of energy felt. As I researched more about emotional stress and the effect it has on the human body and our homes, I began to learn about feng shui, a Chinese practice of using energy forces to harmonize individuals with their surrounding environments. As well as energetic vibration within the items in your home, the placement or arrangement of items in your home can also affect you. Imagine taking a chair from your dining area and placing it in front of your refrigerator to reach something on top. Now imagine leaving the chair there. That chair takes up extra space in your kitchen, obstructs your ability to get into the fridge easily, creates a potential hazard if you run into it with your toe, and pulls your vision toward it. This creates an energetic reaction inside of us. Feelings of annoyance would eventually encourage you to move this chair to a space that makes more sense. At times, the placement of our belongings impedes the natural flow of energy in our homes. If it’s not obvious, such as with the example of the chair in front of the fridge, we may not understand why something doesn’t “feel right,” and we develop automatic reactions to this energy. The first time I lit a bundle of sage and walked through my home, I felt an immediate sensation of calm. This type of calm usually fills me after a relaxing yoga class, postmeditation, or while filling my senses with the sights, smells, and sounds of nature. After snuffing out the smoky sage stick, I slowly walked down my hallway. As if the blinders had been removed, I observed items in my home that “didn’t belong there.” An entire wall of pictures reminded me of the day of the photo shoot. Lower vibrations engulfed that day, but the smiles captured by our beloved photographer were framed and hung for all to see. I now saw the pain in those pictures. They had to go. These were the first of many things to be removed from my home, and this was the moment my personal epiphany with home energy clearing happened. As the years have passed, I’ve created my own method of successfully clearing homes and offices of stuck energy. I begin by encouraging my clients to answer a short list of questions that shine light on the intentions they desire for themselves and their space. These are used throughout the smudging ritual. After the clearing, I am able to offer intuitive recommendations that may help you decide how to make changes in your space. These energy clearings can be done as often as needed or desired, and I’m happy to teach people how to do them themselves. My goal is to bring clarity and balance into people’s lives and homes, and with them the peace, calm, and connection everyone deserves. 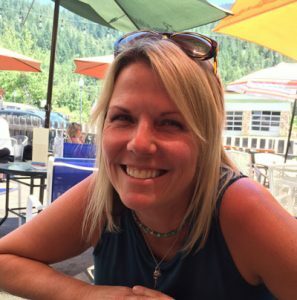 Wendy Brunson is a certified massage therapist and Reiki master. Call 530-591-9063 to schedule your home energy clearing. For more information about Wendy, go to www.Livingfreehealing.com.